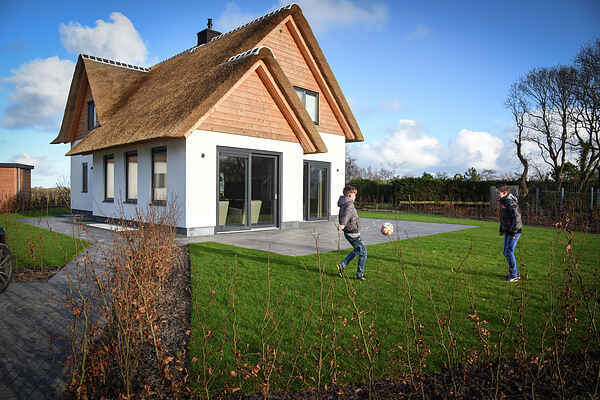 These luxurious,spacious, detached villas are in a separate part of the quiet and small holiday village 't Hoogelandt. The villas (280 m2 floor space ) are located on spacious plots of 725 to 1750 m2 . The decor is modern, stylish and trendy. So, you will find a luxurious and fully-equipped kitchen with cooking island, a long dining table for the entire company and a spacious living room with flat screen TV and a gas fireplace. In the basement of the villa you will find something special; a wellness area with whirlpool, sauna and steam shower. You will find comfortable chairs and a TV here. A great place to relax. The four bedrooms on the first floor are all equipped with comfortable beds and an en suite bathroom. The fifth bedroom is located in the basement. In the storage area, you will find a washer and dryer. There are three separate toilets. Each villa has a spacious garden and terrace with lounge corner. For added convenience, the beds are made ​​upon arrival.